On June 8th, 2015, Nikki and Rodney Wisler of Anderson, Indiana, noticed bruises on their one-month old daughter Leigh Ann. 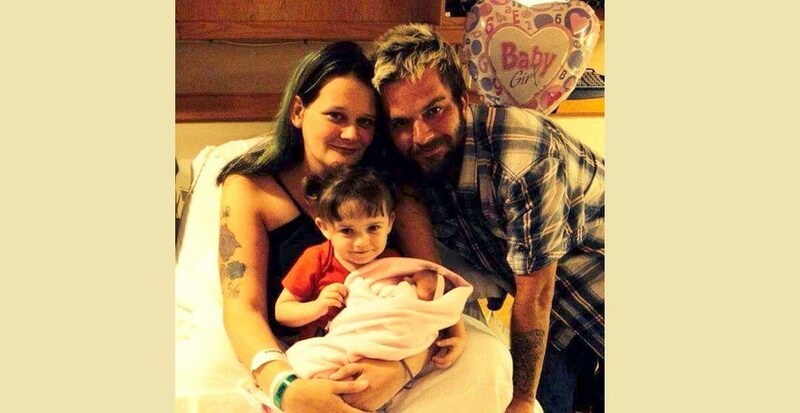 They took her to Community Hospital Anderson’s Emergency Room, as advised by their pediatrician over the phone. The concerned parents worried that their new baby might have a genetic disorder that caused the bruises, since their 2.5 year-old daughter Caridie had been diagnosed with a genetic disorder the previous year. Initially, the E.R. did not find anything of concern, and since the baby was not in pain, they sent the parents home, advising them to follow up with their regular pediatrician the next morning. The following day, their pediatrician sent the parents back to the hospital for x-rays and a head ultrasound. After they left the hospital, they were called back again for additional x-rays to “rule out a fracture.” Later, the pediatrician called them, saying there was a tibia fracture, and directed them to come back to the E.R. to have the baby's leg splinted. The pediatrician explained that she had to call the Department of Child Services (DCS) because there was an unexplained fracture and bruises. Nikki and Rodney weren’t concerned, since they knew they had done nothing wrong. However, they were traumatized when DCS seized custody of their children that night and accused them of abuse. Without an investigation or even a home visit, warrants were issued for the Wisler's arrest. The Wisler's lost everything: their children, their reputations, their jobs, and their home. The Wisler’s are shocked how the system can be so heartless and punitive towards loving parents, and how the doctors, social workers, and prosecuting attorneys are quick to call "child abuse" and destroy a family without an investigation or any evidence. Further evidence has shown that there was actually no fracture, and doctors have reversed their opinions on the matter. However, the Wislers are still without their children, and without employment as the community believes they are guilty of child abuse. I'm glad their side of the story is finally getting told! I've known Rodney since I was a kid and I've known Nikki now for several years. I know they aren't child abusers and it's horrible what happened to them. I hope they get justice, and soon! why would the state waste money on them if they didnt think anything was wrong with the baby? they couldn't hold down a job or a house before this all happened, nothing changed except somebody saved a child. there is two sides to every story. just dont assume they are victims if you weren't directly involved in the situation. Adminlf said: > On June 8th, 2015, Nikki and Rodney Wisler of Anderson, Indiana, noticed bruises on their one-month old daughter Leigh Ann. They took her to Community Hospital Anderson’s Emergency Room, as advised by their pediatrician over the phone. The concerned parents worried that their new baby might have a genetic disorder that caused the bruises, since their 2.5 year-old daughter Caridie had been diagnosed with a genetic disorder the previous year. > > Initially, the E.R. did not find anything of concern, and since the baby was not in pain, they sent the parents home, advising them to follow up with their regular pediatrician the next morning. The following day, their pediatrician sent the parents back to the hospital for x-rays and a head ultrasound. After they left the hospital, they were called back again for additional x-rays to “rule out a fracture.” > > Later, the pediatrician called them, saying there was a tibia fracture, and directed them to come back to the E.R. to have the baby's leg splinted. The pediatrician explained that she had to call the Department of Child Services (DCS) because there was an unexplained fracture and bruises. Nikki and Rodney weren’t concerned, since they knew they had done nothing wrong. However, they were traumatized when DCS seized custody of their children that night and accused them of abuse. > > Without an investigation or even a home visit, warrants were issued for the Wisler's arrest. The Wisler's lost everything: their children, their reputations, their jobs, and their home. The Wisler’s are shocked how the system can be so heartless and punitive towards loving parents, and how the doctors, social workers, and prosecuting attorneys are quick to call "child abuse" and destroy a family without an investigation or any evidence. > > Further evidence has shown that there was actually no fracture, and doctors have reversed their opinions on the matter. However, the Wislers are still without their children, and without employment as the community believes they are guilty of child abuse. There are many stories out there about how public defense attorneys are buddy-buddy with the prosecution, case workers, etc. This sounds like the attorney has a mind already made up about this or doesn't have any skin in the game. Get another attorney if you can! Seek assistance with other local agencies. That child abuse specialist should have her name publicly displayed everywhere to know that she made a huge mistake in the results. I guess it goes to show that abuse specialists see abuse everywhere even where it is not. Go to the supreme court go higher take it all they way contact your president of the united states and question his countries judicial system.